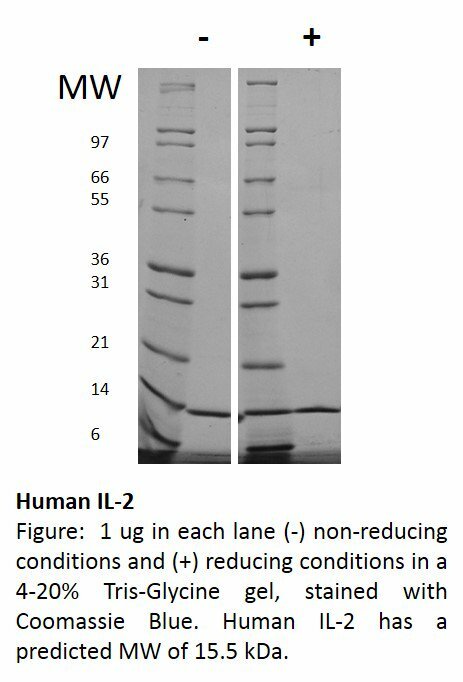 IL2 Protein LS-G23498 is Recombinant Human IL2 in E. coli It is biologically active and is low in endotoxin Less than 1.0 EU/µg protein (determined by LAL method)..
Interleukin 2 (IL-2) is an immunomodulatory cytokine that is produced by lymphocytes. IL-2 signals through the IL-2R receptor to induce activated T cell proliferation and promote T cell differentiation. IL-2 also stimulates the proliferation and differentiation of B cells, natural killer cells, monocytes, and macrophages. This product is produced with no animal or human origin raw products. All processing and handling employs animal free equipment and animal free protocols. Tested using: CTLL-2 cell proliferation. Less than or equal to 3 ng/mL and greater than or equal to 3.3 x 10^5 units/mg. In addition to the acceptance criteria, this product has been tested with the following assay: Primary human T cell proliferation (typical ED50 is less than 1 ng/mL). 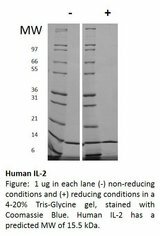 The specific activity of Human IL-2 is approximately 1.8 x 10^4 IU/µg, which is calibrated against recombinant human IL-2 WHO International Standard (NIBSC code: 86/500). Reconstitute in sterile 10 mM HCl at a concentration of 0.1 mg/ml. Store at -20°C to -80°C for up to 1 year. Store at 4°C for up to 1 month or up to 3 months at -20°C to -80°C after reconstitution.